Home»Diapers & Wipes»Pampers Active Baby Diapers XL. About Pampers Active Baby Diapers XL. 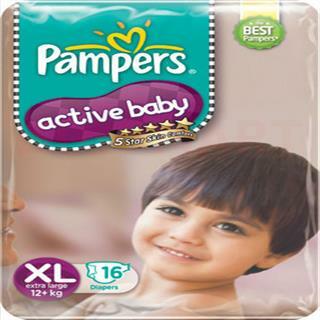 Pampers active baby diapers XL. While your baby is learning to stand, he falls andtopples more than he actually stands. All this pressure on the diaper could puthis skin in contact with wetness which can cause interruptions and take awayall the fun! Now, Pampers Active Baby has an Extra Dry Layer that preventsurine from coming back to the top sheet. This allows Pampers Active Baby tokeep your baby dry, even under pressure, so he can play uninterruptedly. Magic core: Great absorbency for dryness and helpsprevent leakage. Soft cotton like outer cover: Soft touch with greatbreathability to help prevent skin irritation. Balloon stretch tapes: Expands and contracts for a goodfit around the waist for your babies comfort and to help the baby move freelyand easily in these baby diapers. Hypo allergic lotion with aloe vera extract: Helps gentlyprotect babies skin to prevent diaper rash.